Ryan Shawcross and Aaron Lennon have been recalled to the England squad for the World Cup qualifiers against San Marino and Poland in October. 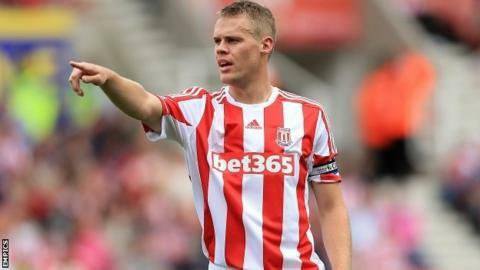 Stoke City centre-back Shawcross, 25, is yet to win his first cap. He replaces John Terry, who recently announced his international retirement. Tottenham winger Lennon, 25, is also back after a two-year absence. Celtic goalkeeper Fraser Forster, 24, is called up for the first time, while forward Wayne Rooney returns. Celtic manager Neil Lennon wrote on Twitter: "Well done Fraser Forster - it's fantastic recognition for him and Celtic... he thoroughly deserves this." England manager Roy Hodgson opted against recalling 33-year-old Manchester United defender Rio Ferdinand, who has not played for England since 2011. Club team-mate Rooney missed England's win over and draw against in the first two qualifiers due to a leg injury sustained against Fulham. Shawcross was named in former coach Fabio Capello's squad for the friendly against Egypt in March 2010, but was an unused substitute. Last month he turned down the opportunity to play for Wales, despite being eligible because he had completed five years' compulsory education there. "I'm delighted for Ryan - I've seen him get better and better," Stoke chairman Peter Coates told BBC Radio Stoke. "He's one of the best central defenders in the Premier League. It's also great for the football club. This gives the club prestige and shows we've got good players here." Left-back Kieran Gibbs, who has impressed for Arsenal in the opening month of the season, replaces Chelsea's Ryan Bertrand. Lennon, who has not played for England since the 2010 World Cup, boosts the midfield, with Liverpool's Steven Gerrard suspended for the match against San Marino at Wembley on 12 October. Hodgson explained that he was keen to see the three outfield players he has selected for the first time. "Gibbs, Lennon and Shawcross are players we need to see at closer hand," he said. "I have seen them from the stands but it will be nice to have a chance to work with them and see how they could contribute to the team we are trying to build up." Steven Gerrard is suspended for the game against San Marino, but will be eligible to return four days later in Warsaw for the game against Poland. Hodgson is relaxed over the experience of the senior players he still has available for the San Marino clash. "We have enough leaders," he said. "Steven Gerrard and Frank Lampard are the captain and vice-captain. "We also have people like Phil Jagielka, Michael Carrick, Joleon Lescott, Ashley Cole and Glen Johnson. Who knows which of these younger players emerge as leaders?"